Step Timer is a basic timer for mapping out complex multi-part cue timings in sound, lighting, projections, automation and video. 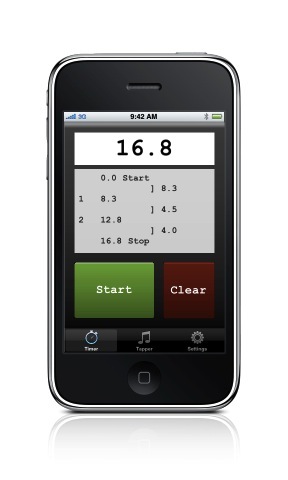 It's also a music tempo timer for design effects to match a beat. Like the iPhone's built-in Clock app, Step Timer can mark intermediate times while the timer is running, but it also displays the elapsed time at each mark. When designing cue sequences with delay and follow times you'll want both types of timing data. Step Timer also has a beats-per-minute clock and its more useful inverse: a time-per-beat display, which is very useful for designing timing to run synchronously with a music tempo. Step Timer can display fractional seconds in tenths, hundredths, or frames.